Former Great Britain rugby league winger Brian Carney has moved to the 15-man code after signing for Heineken Cup champions Munster. Carney, 30, announced his retirement from rugby league two months ago. Munster have agreed a compensation deal with Australia's Gold Coast Titans, whom Carney had just joined on a two-year deal before quitting the game. "It's a tremendous honour to be signed up by a club like Munster," Carney told Munster's official website. "My first objective is to get into that Munster side and become a player that the players want in the team. "To do that I know I have a lot of hard work ahead of me, but I'm prepared to knuckle down and see how things progress. "Knowing the history of the club, it is a huge honour and I hope I can become a part of a winning, successful side." The autumn World Cup is an obvious incentive for Carney, who is expected to be fast-tracked onto Ireland's summer tour to Argentina, having last played rugby union when he was at school. Munster have lost Shaun Payne, Mossie Lawlor and Anthony Horgan to injury and coach Declan Kidney is delighted to have signed a player with Carney's potential. "Given the injury situation I think it's particularly opportune to acquire someone of Brian's stature and experience for the end-of-season matches in Magners League and Heineken Cup," said Kidney. 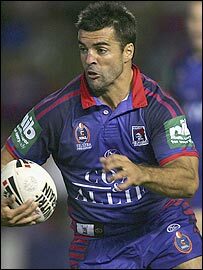 The one-time Gaelic footballer was spotted playing rugby league for a Dublin students team by Gateshead in 1999 and went on to play for Hull and Wigan before moving to Australian club Newcastle Knights last season. He played for Ireland in the 2000 World Cup and won the last of his 14 Great Britain caps in their 23-12 win over Australia in Sydney in November.